Well, it’s not really a tale, per say…but I liked the title so I’m sticking with it. I don’t think I’ve posted a recipe in a while – here’s two! I mentioned my Salad Stir-fry a few posts ago. I first came up with it because I had about a ton of baby greens from my CSA that I realized needed to be used the day they needed to be used if I were to save them from going in the trash. I thought they might wilt down nicely in a stir-fry like spinach does, and I thought it might be interesting to make it salad-like, with a combination of hot and cold components and a thickened salad dressing as the sauce. It turned out so well that I just had to make it again in order to perfect it and post the recipe! Heat the peanut oil in a wok over medium-high heat. Carefully add the onion and stir-fry for a few minutes. Add the garlic/green onions and ginger and cook for 30 seconds, being careful not to burn. Add the carrots, bell pepper and mushrooms and stir-fry until mushrooms release their juices. Add the edamame and stir to combine. Add the greens by handfuls, stir-frying each addition and adding more greens as there is room until all the greens are wilted. Whisk the sauce again and add to the wok. Stir-fry until the sauce coats all the ingredients and thickens. 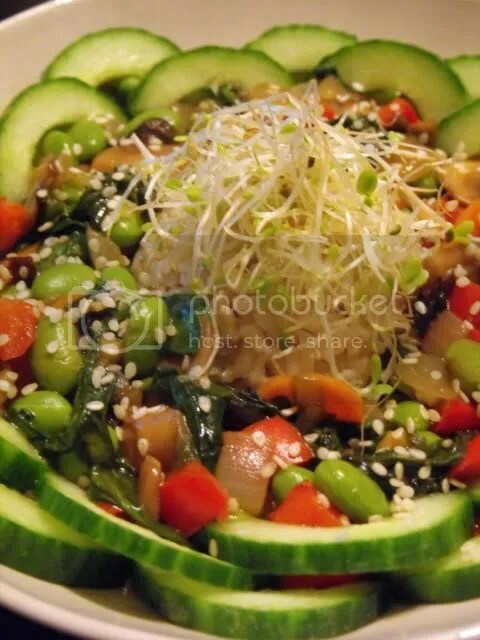 Serve over brown rice, topped with sprouts, cucumber and sesame seeds. Second is a recipe for Swiss Chard Risotto, which I feel like I’ve been working on forever but really have only made three times. It’s just been very intermitent. I guess it’s not really chard season anymore, but it should still be available in some areas. 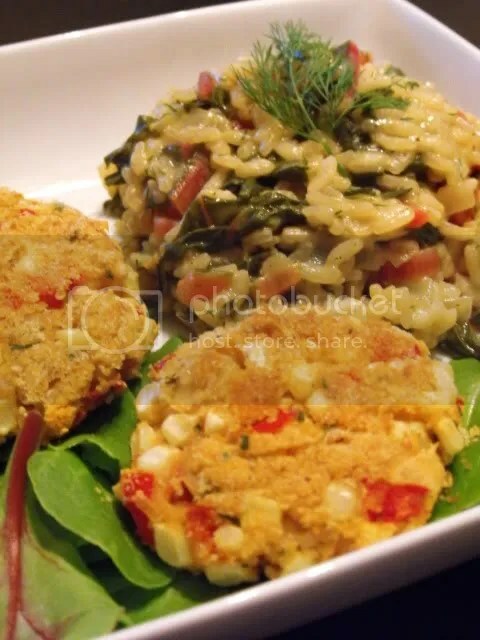 To go with my risotto I made some white bean/corn/red pepper cakes. To be perfectly honest, this was from a few weeks ago and I have NO idea how I made them. I know there was flour and breadcrumbs involved, and I baked them, and they didn’t turn out as firm as I wanted but for a thrown together patty accompaniment they were just fine. This recipe was originally included with my CSA newsletter. I followed it exactly the first time, but it lacked a little something. I also had never made risotto, ever, so I was a risotto novice. Here’s my perfected version! Regular green swiss chard will taste fine, but the risotto will be much prettier with red or rainbow chard. In a medium saucepan, bring the broth to a simmer, adding a pinch of salt if the broth is not already salted. Turn down the heat, cover, and keep warm. Heat the oil in a large, wide pot over medium heat. Add the onion and chard stems and saute until onion is turning translucent, about 6-7 minutes. Add the rice and chard leaves and saute until the chard starts to wilt, about 3 minutes. Add the wine and lemon juice and simmer until absorbed, stirring occasionally, about 2-3 minutes. Add the warm broth one ladle-full at a time, simmering until each addition is completely absorbed and stirring almost constantly. Add the herbs, if using, with the last addition of broth. Cook until the rice is tender and creamy; you may not need to use all of the broth. Add salt and pepper to taste and serve immediately. Lastly, I mention this only because I think it’s a great tip for those trying to reduce their fat intake. 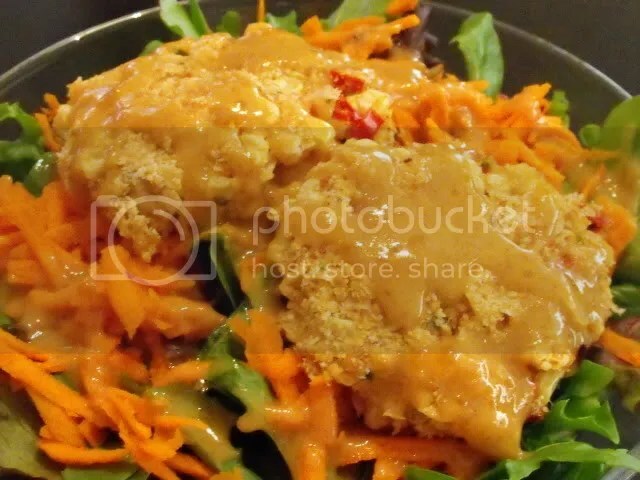 I ate the leftover white bean patties on a salad, and I had just read a tip that day on Eat’n Veg’n for a great fat-free dressing – mix dijon mustard and apricot jam or preserves. I’m sure it would be a lot healthier if the preserves were sugar free – mine were not, but I’m at peace with that. The dressing on it’s own tastes very strong, I was almost worried to put it on my salad. But combined with the salad ingredients it mellowed and I liked it a lot. Give it a try! Mmmm I love them both, but I have a soft spot for both chard and risotto! Yum! The presentation of both is so lovely! yum! so fantastically delicious. must try these recipes. i have never done a vegan risotto. thanks for sharing the dijon/jam idea! so great. ooooh! must try that chard risotto asap! 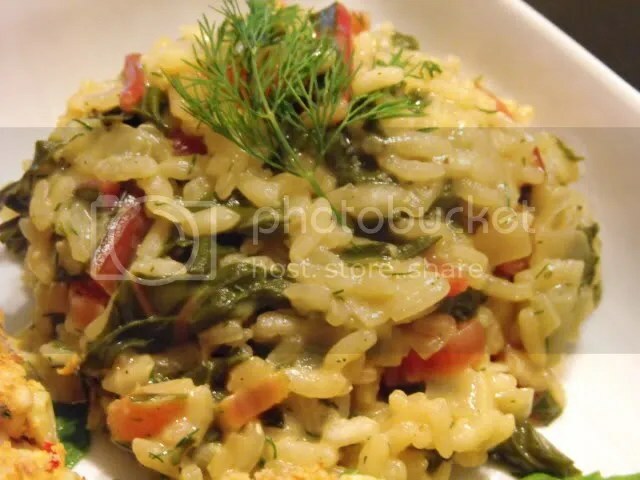 Yum – risotto! 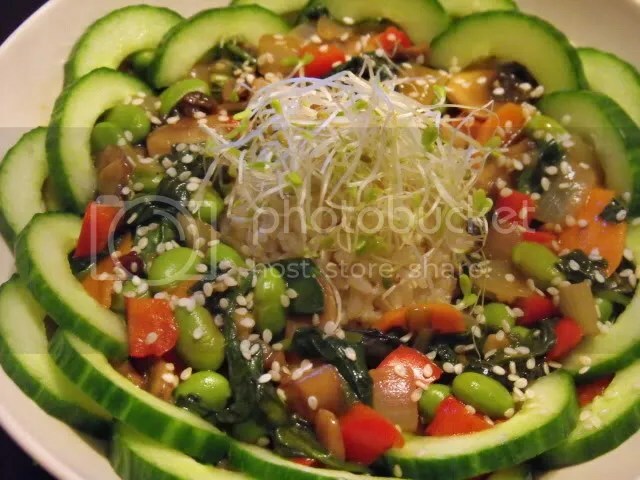 I love the idea for that stir-fry salad and the dressing sounds delicious..I’m always on the lookout for new dressings to try. I thought I was the only person who enjoys hot stuff on cold salad greens. I make that a lot, usually with beans, and I think it’s great! It’s still chard season here, so your risotto sounds like something I need to try. Thanks for trying the dressing. I love mustard sauces, and they do mellow nicely mixed in with whatever. That all looks so good! I love the sound of the dressing too. Love all the different colorful veggies you’ve got going on here- Everything looks delicious! Everything looks so good! I love swiss chard & risotto together, it’s so tasty. Wow that all looks so amazing! I love risotto. Thank you for sharing this recipe. Oooh, thanks, these recipes look great!